How Much Is Your Old Stuff Worth? What resources can you recommend for finding the value of old items? I inherited a large number of old antiques and unique art from my great aunt, and I would like to find out what some of these items are worth. There are actually a number of resources and online tools available today that can help you find out the value of almost any item. Here are some tips to help you proceed. While many people use local antique shops or collectable dealers to find out the value of old and/or unique items, it's usually best to use a certified appraiser who's accredited and meets professional and ethical standards. Certified appraisers are more likely to give you a fair judgment because there's no conflict of interest. It's actually a violation of professional ethics for an appraiser to offer to buy an item he or she has appraised. A professional appraiser will provide you a written report that includes a full description of your item and the procedure used to estimate its current value. For their service, you can expect to pay either a flat fee or an hourly rate from $200 to $400 depending on their expertise and location. Avoid an appraiser who asks for a fee based on a percentage of the item's value. If an appraiser thinks an object isn't worth a written appraisal, he or she might recommend other resources to arrive at a value. To locate an appraiser either by location or specialty, search online at one of the three professional appraising organizations: The American Society of Appraisers, which has around 5,000 members worldwide; Appraisers Association of America that has around 700 members; and the International Society of Appraisers that has about 900 members. You can also get estimates by professional appraisers and other experts through a number of websites. How it works is you upload photos of your items and provide descriptions, and the sites send back valuations usually within a week. Sites that provide this type of service include Value My Stuff, which charges $10 for one appraisal, $25 for three or $75 for 10. And WorthPoint, which charges $30 for one item or $75 for three, or you can pay $20 for a monthly membership that provides unlimited access to their antique and collectables valuations. 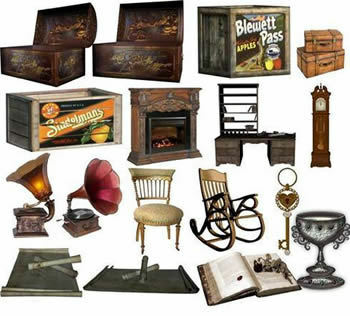 Another resource for finding out what antiques and collectables are worth is Kovels, which offers a free basic membership that gives you access to its online price guide, or you can purchase one of their premium services that run $39 or $60 a year. They also sell the "Kovels' Antiques & Collectibles Price Guide 2014" for $28 that reports on recent prices paid for 35,000 items in more than 700 categories at auctions, shops, shows, flea markets, and online. You may also be able to get an idea of what others are willing to pay for your stuff by searching similar items on the massive online auction site ebay.com, or the classified ads site craigslist.org. Both of these sites are free to search. If you are interested in donating any of your items, you can find out the tax-deductible value at free valuation sites available year-round by tax-prep companies like Turbo Tax, or The Salvation Army.